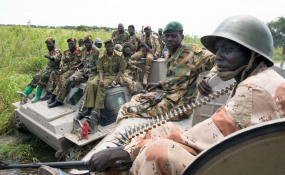 Swaka said the government's South Sudan Peoples Defense Forces initiated the violence. "We have been warning people [since a] few weeks ago that the government is preparing its forces, moving their forces from Juba toward Rokon, toward Torit, toward Lobonok and toward Yei. They are preparing to attack us," Swaka said. A joint statement last week from the United States, Britain and Norway, known as the Troika, said the fighting around the town of Yei represents a "flagrant breach" of a December 2017 cease-fire and the revitalized peace deal signed by South Sudan's government and several rebel groups last September. The NAS told VOA's South Sudan in Focus that President Salva Kiir's administration provoked the fighting in Yei River State, where thousands of civilians are caught in the crossfire. "The government is attacking us [NAS] because the other forces decided to go to Juba under the Revitalized Peace Agreement, but [the] National Salvation and other forces of the South Sudan National Democratic Alliance refused to sign the agreement because it gave everything to Salva Kiir," according to the NAS. South Sudan's conflict, which began in December 2013, killed tens of thousands of people and displaced more than 4.5 million, with 2 million people fleeing to other countries. Several warring parties signed a revitalized peace agreement last September in the South Sudanese capital, Khartoum, to end the four years of fighting between the South Sudan government and various rebel groups, including the NAS. "We are [South Sudanese leaders] forced to sign this agreement. Many people [party leaders] who signed the agreement did not sign it from their hearts. People [were] coerced to sign the agreement, and that is why we say this agreement is not for the people of South Sudan," Swaka said. The Intergovernmental Authority on Development's (IGAD) special envoy for South Sudan, Ambassador Ismail Wais, held a meeting Monday with Swaka to discuss the timeframe for further engagements. The special envoy said in a statement that his office wants to stop the ongoing hostilities, especially in Yei River State and other areas. Wais called upon all other parties involved in the hostilities to abide by the Permanent Cease-fire in the Revitalized Agreement on the Resolution of the Conflict in the Republic of South Sudan (R-ARCSS). The United Nations refugee agency says a surge of violence in South Sudan's Yei River State has displaced some 8,000 civilians and sent an estimated 5,000 people fleeing to the neighboring Democratic Republic of Congo. Witnesses told VOA's South Sudan in Focus that soldiers killed civilians, raped women and burned entire villages — a claim VOA could not independently verify. The spokesman of the South Sudan Peoples Defense Forces has issued several statements calling the rebels of the NAS "enemies of peace."